The outcome of this recipe is perfect for a family of 4 as it makes only 6 muffins. You don’t need butter! You can substitute butter with yogurt with amazing results. Don’t believe me – try for yourself! The recipe has been adapted from the Blueberry Yogurt Recipe from Taste of Home. In a large bowl, combine the dry ingredients - flour, sugar, salt, baking powder and baking soda. Set it aside. In another bowl, whisk together the beaten egg, yogurt, oil and milk. Add in the dry ingredients and combine them until moistened. 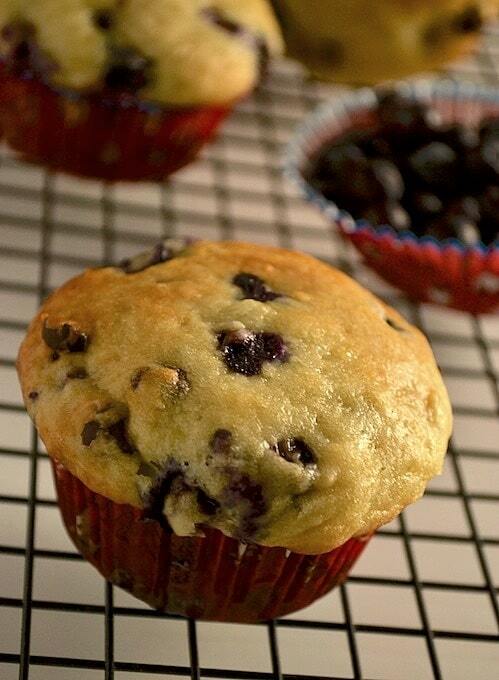 Fold in chocolate chips (if using) and half the blueberries. 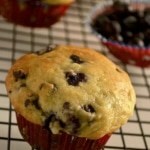 Use an ice cream scoop or a spoon to add the mixture to greased muffin pans or paper lined muffin cups. Add the remaining 1/4 cup of berries on top of the muffins and press them down lightly.